Claiming on home insurance is often unavoidable, but many claims could easily be prevented, potentially saving you the time involved and also, perhaps more importantly, money in the long run. Making a claim can mean you’re seen as more of a ‘risk’ by an insurer; your premiums are put up, and you lose your valuable ‘no claims’ bonus. You will also have to pay the first part of any claim yourself. This is known as the ‘excess’ and can be as much as £500. Depending on what time of year it is, the most common claims change. According to recent research from the insurer Aviva, during last winter the most frequent claim was for escaping water. At other times of the year it’s often accidental damage that hits top spot. However, a little thought and effort can make such claims quite avoidable. 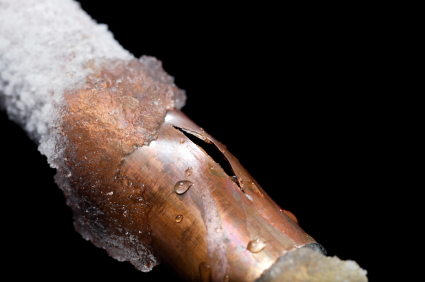 Pipes bursting in winter due to the water in them freezing and expanding are the most often cited reason for this type of claim. Water rushing through a house can cause thousands of pounds worth of damage, bringing ceilings down and damaging belongings. – Set the central heating considerably above zero if freezing temperatures are predicted. – Ensure pipes are insulated in exposed areas such as attics and crawl spaces. – Fitting an automatic stopcock means you’re considerably more protected as it will shut down your water system if it detects either a lack or excess of water flow. – Consider draining the cold water system if you’re away for a while in winter. We can all be pretty clumsy at times, dropping items, perhaps spilling wine on an expensive carpet, or even putting a foot through a ceiling if you’re doing DIY. And having children around heightens the risk of accidental damage even more. – Keep drinks and food away from any kind of electronic equipment. And if there are children in the home, ensure they only eat and drink in the kitchen! – If you’re doing any DIY, always fully protect all furniture, carpets, gadgets and windows. Also wear the right protective gear and check all equipment, such as ladders and drills, are working correctly before use. Claiming for floods, in particular, can seriously drive up the cost of premiums, but there’s little you can do to prevent one from happening. – Put sandbags in places where water might get in, such as outside doors, windows and airbricks. – Move all possessions to higher parts of the house. – Switch off gas, electrics and other utilities at the mains if flooding is imminent. – Move your car to higher ground. – Maintaining your home can protect against storm damage; checking the roof for loose tiles and keeping drains and guttering clear for example. – Roof covers on external buildings such as garages and conservatories should be kept in good order. – Check aerials are secured and chimneys in good order. – Put away items such as bicycles, garden furniture and expensive potted plants if high winds and storms are forecast. – Clear the external parts of your property of anything that could be easily lifted by strong winds and potentially cause damage. Burglary of homes and other forms of theft are one of the main reasons people make claims. – Always check doors and windows are locked if you leave your property, even for just a short while, and especially in the evening or for a few days. – Consider having timer devices fitted to automatically switch on lights and radios at certain times of the day and night. – Get a neighbour or friend to enter the property and open and close curtains in the evening and mornings. – It’s easy to forget to check that entrances to external buildings are also locked and secure, such as for garages, sheds and garden studios. – Placing fencing and growing foliage in front of windows and doors at the front and rear of properties is a good deterrent. – If you go on holiday, cancel newspaper and milk orders and, if you can, leave a car in the drive.